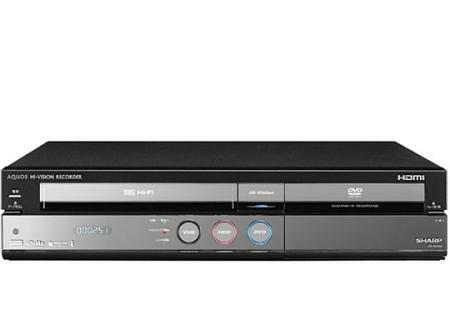 Sharp have announced the new Sharp Aquos DV-ACV52 media recorder, which offers not just a DVD player, not even a DVD player and 250GB HDD, but a DVD player, 250GB HDD and something called a VHS video recorder. Apparently, VHS is an old analogue tape format for recording TV programmes in the days before digital, and Sharp feel that there’s still enough life left in the format to warrant the release of a new media recorder supporting the technology. Of course, simply releasing a video recorder wouldn’t be enough on its own, as that really is yesterday’s technology. But releasing a video recorder in a unit that also includes a DVD player and internal 250GB HDD means that the Sharp Aquos DV-ACV52 really can lay claim to being a complete media recorder as it’ll record and play your TV programs in nearly all of today’s (and yesterday’s) formats. It even comes with HDMI and a digital TV tuner, too, so you can boast to your friends that you have the very latest and the very oldest technology, all in one box. Furthermore, the Aquos DV-ACV52 isn’t like your dad’s old VHS recorder. From off to on takes just 0.8 seconds, for example, while attaching the DV-ACV52 to a Sharp Aquos TV will let you record two digital channels simultaneously (one on video, the other onto the 250GB HDD). Makes you almost nostalgic for the good old days of video doesn’t it? Actually, with the thought of chewed up tapes, the limited life span of a video tape, and constantly having to find space on the tape, or else overwrite what you’d already taped – no, video was a technology long past its prime! The DV-ACV52, therefore, may represent the very last generation of VHS video recorder, so get one for its potential as a future museum exhibit, if nothing else! The Sharp Aquos DV-ACV52 release date is May 21st 2007, priced at an eye-watering $925.